to a special brush that she uses when painting skies in her pieces. McKenna said she paints anywhere from 8 to 10 hours a day when the deadline for a show is approaching. Sydney's contemporary atmospheric oil landscapes, and husband Rob Mitchell's functional and decorative pottery are created at their home; located on Anastasia Island, less than one mile from downtown St. Augustine. 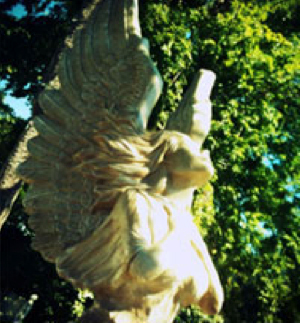 For information on commissions, or to visit, call 904-824-2414. 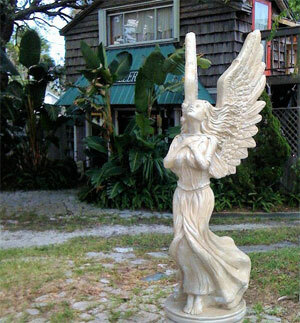 The statue of an angel is poised in front of Sydney and Rob’s home studio in St. Augustine, Florida, never taking her eyes off the sky, wings at the ready. She provides constant inspiration for Sydney’s specialty: her search for those moments when the physical and spiritual join together in the constantly shifting humid atmosphere of Florida. In Sydney’s work you will find oil paintings of cloud and sky in their most ethereal states. A lover of science, the mingling of water throughout our world is at the root of her message. There is the shocking orange of sunset mingling with the dramatic sweeping of clouds across the sky, a majestic emerald dreamscape of a tiny city perfectly tucked away between a swirl of water and sky. In clouds, with their constant march and vigil across the sky; and in trees, reaching for light and water, she finds the transforming reminders of the give and take of life itself. Her oil paintings demonstrate the wonderland that Florida truly is. Whether beach, river, tiny inlet, lush flora and fauna, Florida has the perfect framework for the constant drama unfolding in the skies above. “Another pleasant surprise was the visual expanse, graphically and aesthetically, that has taken place in the work of Sydney McKenna. Her skies are shocking in their definition, overpowering and overwhelming. True Florida skies, she has taken the firmament from a mere backdrop to a visual ‘vault of the heavens."